This work is a masterpiece of restraint, skillfully blending naturalism and psychological realism. The three-quarter-length portrait is set against a plain, deliberately abstract background. The sitter’s forceful presence is heightened by the intensity of his gaze, his hieratic bearing and his dignified features, marked by age and experience. Contours and shading have been applied with extreme precision, creating a depiction that is as detailed and lifelike as a photographic image. 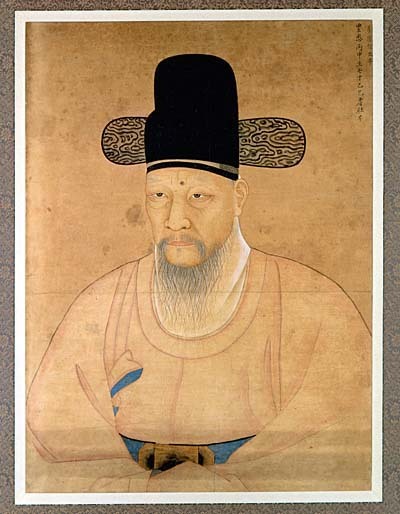 He is wearing the traditional costume of the late Choson period: a light colored, full robe, fastened at the waist with a sky blue belt, and a winged, horsehair cap. The form and symbolic character both come from the Chinese Tang dynasty (618-907 ) and are representative of the class of scholarly civil servants under the Yi dynasty who had adopted Neo-Confucian philosophy. The calligraphy at the top right hand corner of the composition presents the seventy-year old senior official under his pseudonym “P’ung eun”. Yi Han-Chol (1812-1902, 1812-1910 or 1808-1910), a professional painter and member of the Academy, has painted a highly intense portrait that radiates a striking tranquility and humanism. With sensitivity and virtuosity, the artist has succeeded in capturing the lifelike image of a mature man, and in conveying the sense of sheer moral discipline that prevailed among the contemporary class of intellectuals in this “Hermit Kingdom”, voluntarily cut off from the outside world. The portrait, dated 1845, is a work of maturity. Already in full possession of his art, the painter launched on a court career, painting the portraits of the last sovereigns of the Yi dynasty. This extremely important work epitomizes the harmonious blend of the psychological portrait peculiar to scholarly circles and the illusionism of Western art introduced into Korea via China.